Was $243.99 You save $139.00! Take power with you wherever life takes you with this Cobra 1500 3000 Watt AC Power Inverter with 3 Outlets and USB. This inverter converts battery power to 120 volt AC household power for anything from office equipment to small household appliances. The Cobra is perfect for camping, tailgating, and road trips. 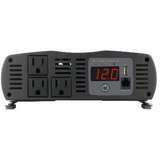 This inverter has 3 grounded AC outlets and a digital display to show your vehicle's voltage and how much the connected devices are consuming. It also includes a USB port to charge up your small video games, mobile phones, and other USB devices. Take the Cobra 1500 3000 Watt AC Power Inverter with you anywhere and it will keep you charged and powered up. I wish it had a sine wave output rather than a step-wise approximation to a pure sine wave output. But the unit is relatively low cost so that is the tradeoff, I guess. I use this in my semi to power a refrigerator and my coffee pot, cobra is a good name though I've never had anything from them but their cb radios I bought this based on price..for 102 dollars it's a great deal compared to the 175 - 200+ dollars at a truck stop, plus free 2 day delivery..
Freakin easy to use ! I've only had a chance to use this one time, and it had worked perfectly, I bought it strictly so I could have my coffee first thing in the morning when I was camping like taking along my programmable coffee maker and it still left enough juice in my battery to start my truck. Excellent Item and very fast Shipping. Love it! I carry a Samsung laser printer in my truck, and this Cobra device works great with it. Have no complaints, I honestly recommend it. I have a Power Drive 1500 ,but Cobra 1500 performs better. Excellent product, it works great with my laser printer. It's one the best power converter I ever had! Pretty easy to set up, I definitely recommend this device! !